Planning a wedding is no easy feat. There is so much to do, so many details to iron out, and of course, so many Pinterest boards to peruse. But the most important, in my humble opinion, is laying out the logistics of the day and planning the perfect timeline. What can I say, I’m a list maker. I’m a planner, I’m someone who likes to have a game plan. Having said that, I truly am a go with the flow type of person, which is a nice balance for working in the wedding industry. Planning as much as possible ahead of time, allows us to enjoy the day, and allow it to naturally unfold, because we’ve already mentally mapped out our expectations. Make sense? It’s easy to say, “Hey! Make a great timeline!” But what does that really mean? What makes a great timeline? Don’t jam pack your wedding day with dozens of “to-do’s” and no wiggle room. If you think something will take you 30 minutes, plan for 45. You may not need that extra buffer for each part of the day, but by adding a few extra 10-15 minutes here and there throughout the day, you’ll never actually run out of time. If you are 15 minutes late getting into your dress, it’s ok, because we buffered for extra time during portraits, so there is no need to stress! Two hours may seem like a lot of time for portraits, but if you are wanting to take them at a separate location than your ceremony or reception, be realistic. Between transporting a dozen people across town, getting everyone out of the party bus, jackets back on, flowers passed out, and everyone picture perfect ready, attempting to do THREE separate photo locations may not be realistic within that time frame. If having ALL of those locations is a must, make sure you plan your day accordingly and allow for enough time. ALSO, keep in mind, if you have rented a party bus, it will go slower than you will in your own car! Decide if you are doing a First Look. Doing a first look or not will dictate the majority of the day. If you decide to do one, chances are, we will do the majority of your portraits before the ceremony. Which means POST ceremony, you can do your family formals and then head straight to cocktail hour! If you decide NOT to do a first look, make sure you allow for enough time between the ceremony and reception for bridal party photos AND bride and groom portraits. There is no right or wrong way to do this, but something to think about! WONDERING IF A FIRST LOOK IS RIGHT FOR YOU!? Check out the post here! This is the number one thing my couples completely forget about. The receiving line. Are you having one? When do you plan on having it? A few tips/options: Immediately after the ceremony. This is most traditional, HOWEVER, make sure you budget in the time for it. If you figure 10 seconds per person (again, allow for wiggle room!) and you have 150 people, we are looking at roughly half hour (plus). Not to mention, your mom’s are going to want to chat to EVERYONE! Again, no big deal as long as you plan for this! The other option, is having it during/ at the end of cocktail hour. Benefits of going this route… First, people are hungry so they will want to get in to the reception, sit down, and get the party started! I.e. they won’t want to chat as much. The second benefit of this, is not everyone will make it to your ceremony. 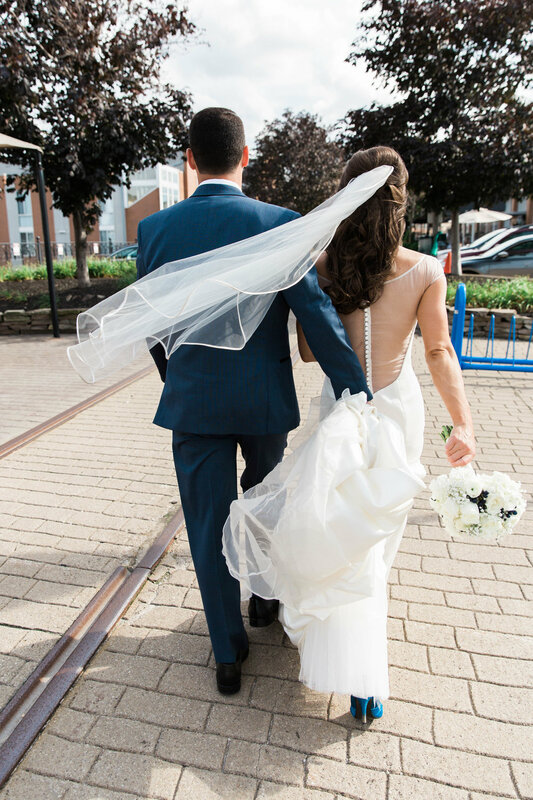 Going this route will allow for you to see more of your guests in the receiving line! Seriously. Better said than done, I know. But at the end of the day, you will be married and that is what truly matters. The wedding day itself is simply the icing on the cake. So relax, enjoy whatever the day throws at you, and remember for better or for worse, your day will be your story for years and years to come! There you have it. My 5 tips for creating the perfect timeline! If you have any further questions/concerns, feel free to shoot me a message! Let me start by saying, I will never sway you one way or another on this issue. I may offer recommendations, but they are recommendations to best accommodate your overall vision. Whether or not you do a first look is completely up to you and your fiance, but I can give you a few pointers. Want to do ALL of your portraits before the ceremony. Doing the portraits (and maybe even family portraits!) before the ceremony, will allow you to flow right into enjoying cocktail hour and the reception immediately after the ceremony. Don’t want your guests to have to occupy a several hour gap in-between the ceremony and reception. Please let me preface that I do not think this should be your number one concern, but for some people, this is an important aspect. You want to have a late afternoon/evening ceremony. There is something very romantic about having a sunset ceremony, with the golden hues and relaxed atmosphere. Having said that, the later your ceremony is, the less time we will have afterward for photos, as we will be racing the light (even if it isn’t necessarily a sunset ceremony). You want a REAL reaction. When you do a first look, you not only SEE each other beforehand, you get to embrace, and kiss, and laugh, and cry, and breathe! You get to take a few minutes for yourselves before all the festivities really begin, and spend the majority of your day TOGETHER. Or maybe…. You simply cannot wait to see your better half! You’ve simply always dreamed of walking down the aisle, seeing each other for the first time on your big day right then and there. There’s nothing wrong with keeping it traditional! You are completely indifferent one way or another and simply wish to base it around whatever time your ceremony is! There is NO WRONG WAY TO DO THIS! There are plenty of logistical reasons to suggest doing the first look or not, but ultimately, it comes down to YOUR vision of your big day and everything else will simply fall into place! As always, if you have any further questions, don’t hesitate to ask! You get to wear this gem ONE TIME! That's it! Make the most of it and get your money's worth! If you want to lay in the grass, GO FOR IT! If you want to walk by the water, DO IT! Dance around and have fun, worry free! It's most likely white, or something close to it. The truth is, it's going to get dirty. But a little secret... considering it is an all white dress, I'm willing to bet you will be shocked that it isn't dirtier by the end of the night! NO ONE is looking at the hem of your dress. NO ONE is looking down thinking, "oh man, if only it hadn't touched the ground." I promise! Do you, have fun, and push the boundaries. Don't stress the dress!